Customized bird control, removal and prevention solutions from a company you can trust. Pest birds, droppings and nesting material cause tens of millions of dollars in property damage every year and can contribute to respiratory ailments, viral infections and food poisoning. 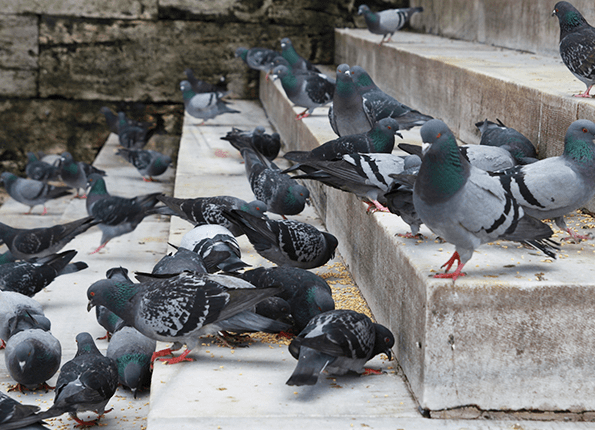 Don't let pigeons and other pest bird problems overtake your commercial facility; Action Pest Control provides bird control services that make pest birds problems take flight! The professionals at Action Pest Control have been successfully solving pest bird problems for over 30 years. We offer a complete range of pigeon control and other bird control services that place the highest priority on safe and humane treatment of all birds. In fact, we focus on non-lethal bird deterrent, removal and harassment techniques. Installations and elimination techniques will vary depending on the species of the pest bird. Common pest birds include pigeons, starlings, swallows, geese, ducks, and English sparrows. Though bats are not a bird, they can be very damaging to a structure. Regardless of species, Action Pest Control is equipped to eliminate your pest birds. Don’t risk the bad publicity and environmental irresponsibility that can come from using a less knowledgeable company with inferior bird control methods and solutions. Trust Action Pest Control for dedicated personnel who specialize in bird control and have the experience and education to see that the job is done correctly. Contact us for a free bird control inspection. Serving Indiana, Kentucky, Illinois, and surrounding states including Ohio, Tennessee, Michigan and Missouri. Pests around commercial properties are more than just bad for business - they can be dangerous. Find out how our professional, commercial pest control services can make pests mind their own business. Find out more about Action's commercial fumigation services and how we eliminate even the toughest infestations. Invasive pests don’t stand a chance. Birds may be beautiful in nature, but they aren’t when they’re causing problems in and around your facility. Find out more about the problems pigeons, woodpeckers, and other pest birds can cause, and how Action’s bird control methods succeed in protecting businesses. Bed bugs can ruin your businesses credibility. Protect your brand and your reputation with Action Pest Control.